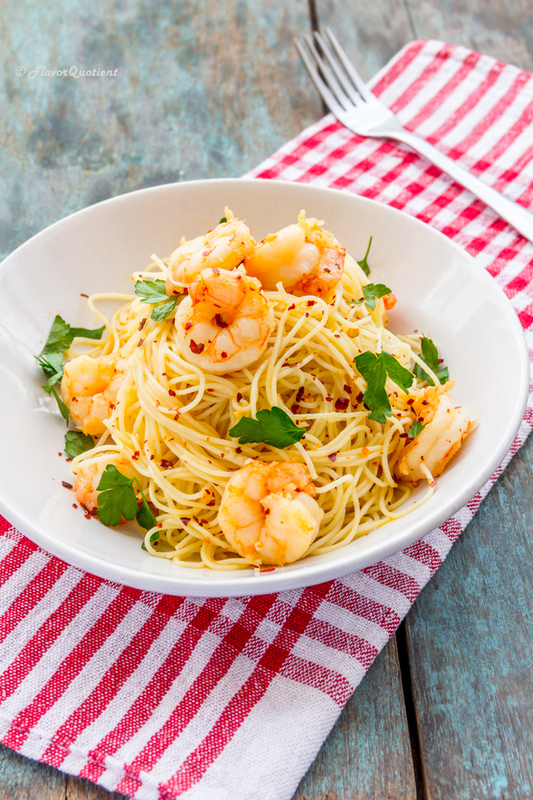 Shrimp scampi in the lemon-wine sauce served on top of capellini or angel hair pasta will be the best summer pasta you ever had. The kick of chilli flakes complements the shrimps and the lemony sauce perfectly! I was looking for pasta recipes which involves little less cheese than usual. It’s not that I don’t like cheese, I can actually live on them! But just for a change and then this angel hair pasta with seafood started shining on me. 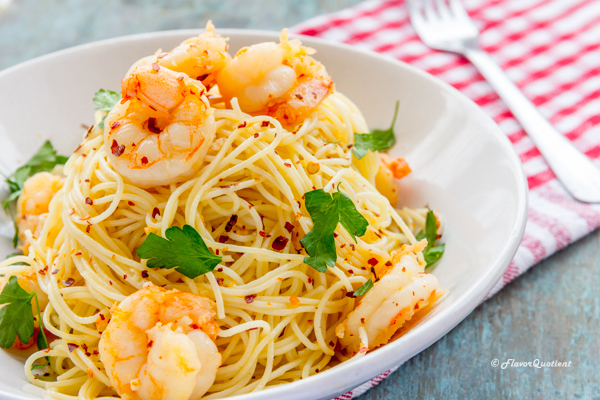 Pasta with prawns! Wow! that sounds interesting! 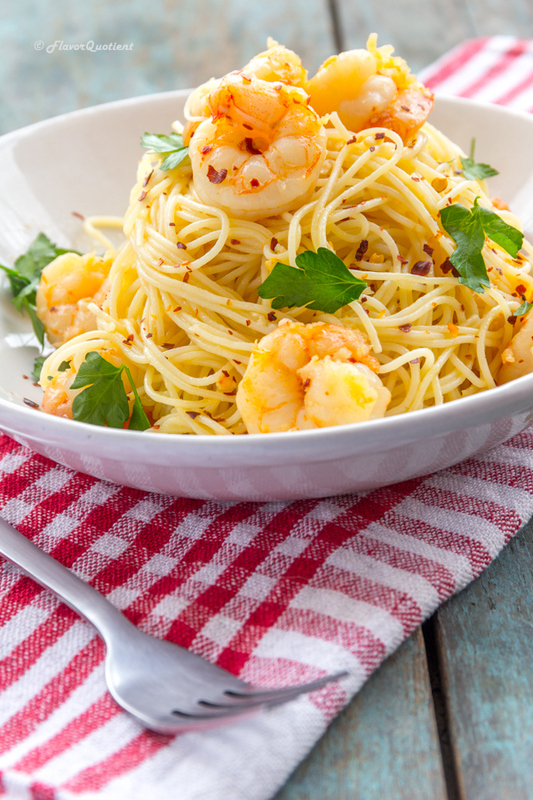 Angel hair pasta or capellini is best served with seafood. This one is a very thin, long pasta which is why I guess [and that’s my educated guess], it is not usually served with a heavy cream sauce. The pasta texture is best complimented with a light sauce and loads of seafood! The other day I was wondering – will I be able to survive on only pastas being raised on rice and rotis and curries? 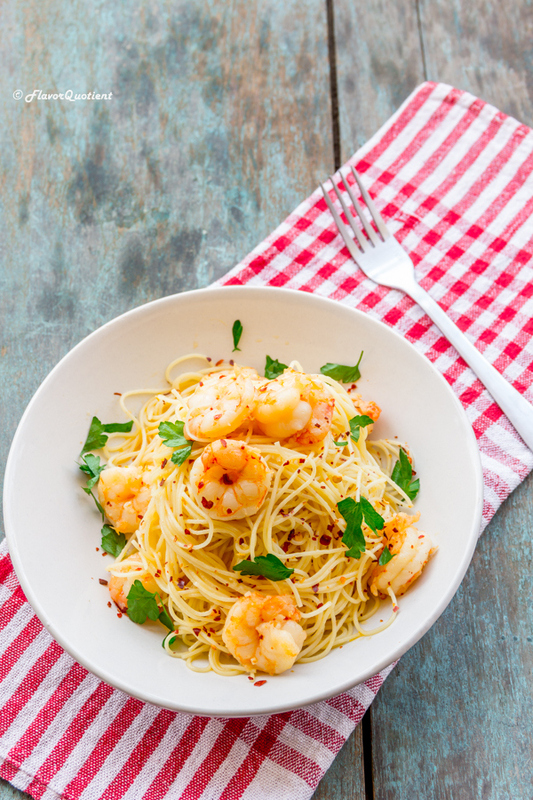 The answer to that is of course this shrimp scampi with capellini! I am a seafood lover and prawn being the topper, I can have this pasta every day. The lemon wine sauce is something new I tried and fell for it immediately. I never could have imagined such flavorful stuff can be created so easily and with just so few things! I am not sure why the capellini or angel hair pasta is not so popular yet in India. Mostly I see spaghetti for long and penne for shorts in restaurants here but I found capellini suiting to our tastes more than its thicker counterparts. This one is very similar to the Chinese noodles in shape and texture but of course the raw materials for making these two are different. 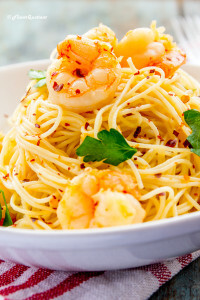 I was already in love with stir-fry noodles but not it has got a tough competition with capellni shrimp scampi! As I mentioned above that this is a pasta with lesser cheese than usual, let me give a little more context on that. Among the many recipes I studied, there were many who didn’t add any cheese at all and some added just few sprinkles of grated parm just before serving. So I thought of trying both – with and without cheese. My verdict? Honestly I loved both. If you are an ardent cheese-lover, you will love the cheesed-up version, and if you are not too keen about cheese you will love both. Try this for yourself and let me know which one you preferred! Deal? Cook the capellini according to package instructions. Capellini or angel hair pasta is a very thin, long pasta which takes just 2 to 3 minutes to cook in boiling water [Make sure to season the water with good amount of salt]. Once done, drain and rinse with cold water. Let all the water drain out. Then add a teaspoon of olive oil so they don’t stick. Set aside while you prepare the lemon wine sauce for shrimp. In a medium skillet, heat the olive oil and add the peeled and deveined shrimps. Fry the shrimps for a minute until they turn pink on both sides. Next add the minced garlic, chilli flakes and butter. Let the garlic become fragrant and butter melt. Next add the lemon zest, lemon juice, salt and pepper to taste. Stir to mix everything well. There should be still some liquid left in the pan which will help the capellini absorb all the flavors. Add the boiled pasta to the pan and give a good stir. The sauce will be almost absorbed by the pasta. Remove from heat and serve warm garnished with fresh chopped parsley.